Even though November was the only time of year Jane and Mark could get married to give their relatives living abroad enough time to organise time off work and travel arrangements, they were still determined to get married outside. Despite the chilly weather, they had always loved the great outdoors and didn’t want to be cooped up in a function room for their special day. They hired the outdoor area of a local country hotel, who had promised to provide a lot of extra outdoor heaters, but they needed some equally heart-warming food to keep their guests happy and stop them from shivering! They thought a hog roast would be a good option, but they weren’t sure if it was elegant enough for their wedding breakfast or suitable to meet the needs of all of their guests, 10 of which were vegetarian. Their opinion changed rapidly though when they saw Taste The Cracklin’s extensive range of sophisticated wedding menus! For their 80 guests, they chose our signature hog roast with all the trimmings, along with tasty veggie skewers and our homemade quiches for the non- meat eaters. 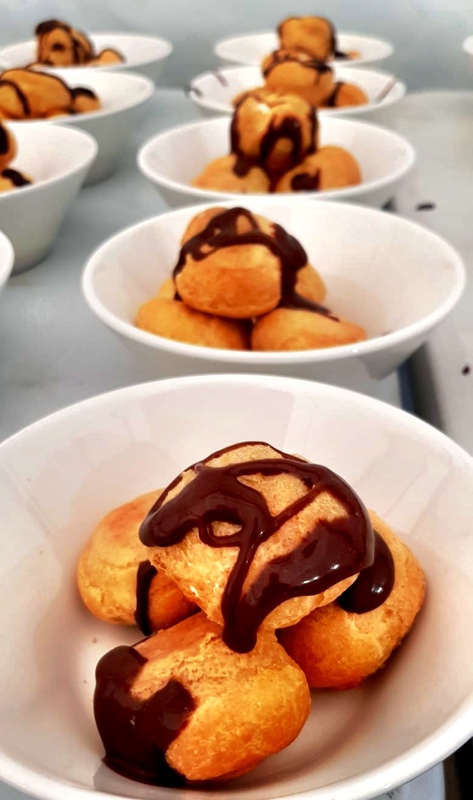 They wanted all the main options to be accompanied by our seasonal vegetables and rosemary roast potatoes, preceded by our winter warmer homemade soup and polished off with profiteroles and individual cheesecakes. Not only were the bride and groom thrilled with their chosen menu, they were also very impressed with Taste The Cracklin’s ability to make everything from scratch at their venue and they couldn’t wait to try our food! As the bride and groom and all of their guests were focusing on the ceremony, we were at their venue working tirelessly to get everything perfect for their arrival. By the time the wedding party reached the hotel, the food was immaculately prepared and ready to be served by our super professional waiting staff! The hotel heaters were also on full blast to ensure no one had to ruin their snazzy wedding outfits by having it sit through the meal with coats and woolly hats! The guests all loved the food and soon forgot about the chilly November weather as they tucked in! Jane and Mark were over the moon with the level of food and service they received throughout their reception and they thanked Taste The Cracklin taking everyone’s minds off the grey skies and blustery wind!